When you’re with a group for a party, what would you rather do: watch a computer screen for a YouTube marathon that you’ll soon forget or go outside and forge memories that you’ll remember for years? Here are four fun outdoor games for kids, teens, and adult groups to help you bring the excitement outside, regardless of the age range of the people around. Regular volleyball except that the ball is tossed over the net using towels. The towel is held on both side by two players and the ball is cradled in the towel. By pulling it taut, the ball is flung to the other side. You can make the game even more entertaining by replacing the ball with water balloons. Obviously, this outdoor group game is best played during the day. A simple game to get kids moving. Played on a lawn, the players hold hands in a circle and place something in the middle that is considered poisonous. A chair or bean bag is ideal. Anyone that touches the item is out of the game. As the players circle the item, they pull each other toward it, trying to force the others to touch it. Just make sure no one is being overly physical. While this can be a night game, it’s best played when everyone can see the poison easily. We won’t bore you with how to play the original, but this game is awesome! Break into evenly-sized teams. Have each team huddle and decide what action (paper, rock or scissors) their team will make. Then the two teams line up about five feet apart from each other and throw down. The winning team then darts after the losers and tries to tag them. The losers are dashing toward a safe zone behind them. Anyone that is tagged is brought onto the opposing team and the game continues until all players are on one side. For added confusion and fun, play with three teams! 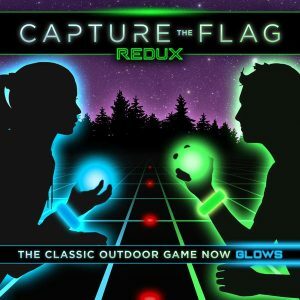 You can even re-purpose your Capture the Flag REDUX kit to turn this into a night group game, by choosing a red, green, or blue light after agreeing to which wins over which. Naturally, we’d put this here. But it’s true! 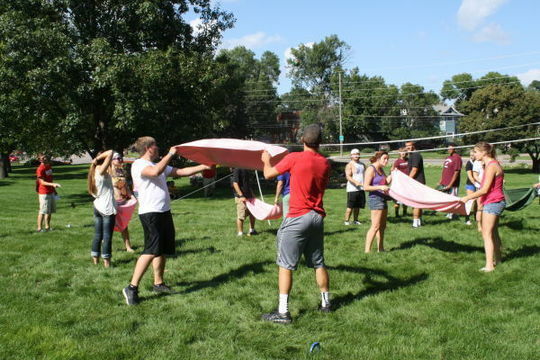 Capture the Flag REDUX is an amazing night group game! For those of you that already have it, you know this. For those of you that don’t, you will definitely figure it out! It is one of the best outdoor glow in the dark games for groups you will ever play. Period.